Some of you may be wondering why there is no picture of armour here when our lesson is about taking upon you the whole armour of God. In fact this man looks somewhat unprotected compared to those around him firing arrows at him. I decided to choose this picture for this lesson today as it highlights that God's armour is a spiritual armour - unseen by others. 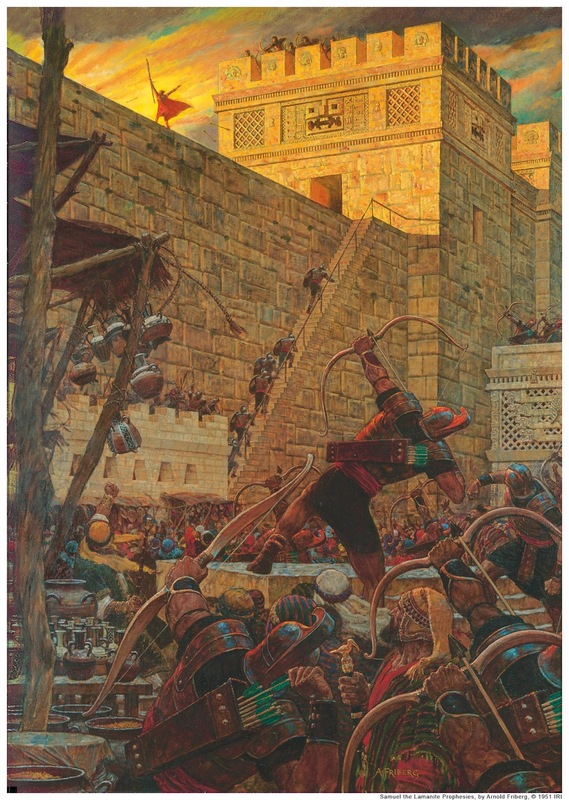 For me this picture of Samuel the Lamanite being protected against the arrows of his enemies, better illustrates the concept of the spiritual armour of God and its power in our lives. Aside from the story we know of Samuel the Lamanite - what can you see in this picture? A man is standing on a wall, apparently unprotected, open and exposed. We see soldiers shooting arrows at him from all angles and others climbing closer in an apparent attempt to capture or kill him. They are not a few. How does this picture represent us today? See Doctrine and Covenants 76:29, Ephesians 6:12, Doctrine and Covenants 27:15-18. What are we "encompassed round about" with by Satan, in his war? The scriptures call them fiery darts. What does the phrase "fiery darts" tell us about what kind of challenge they will present to us? Darts are quick and fast. They will hurt us if we are not on our guard. If they pierce us, not only do we feel them but we feel their fire also. You do not want to get hit by one of those arrows. It can mean spiritual death. What do they represent? Temptations and tribulations such as materialism, immorality, dishonesty, minimization of God, etc. Three such temptations that the lesson asks us to focus are immorality, dishonesty and the minimization of God. Satan really can hurt us and those around us with this fiery dart. How does the armour of God help defend against Satan's fiery darts of immorality? Polonius in Hamlet is famous for saying "to thine own self be true, and it must follow, as the night the day, thou canst not then be false to any man." How does the armour of God help us be honest? Sword of truth is truth telling and truth speaking, breastplate of righteousness covers the heart and is truth loving, and together with the loins girt with truth you are covered in truth. Including helmet of salvation. Helmet protects the mind, the thoughts but also the mouth. We minimize God when we take his name in vain and use profanity, but what other ways do we minimize God? Through lack of prayer, and a lack of gratitude. The world minimizes Him by refusing to accept His hand in all things. They demonstrate this by freely taking His name in vain without a thought. Notice the helmet of salvation not only protects the mind but the ears, the eyes and the mouth, suggesting that we must endeavour to keep our minds clean and defend against allowing anything into our sight or hearing that would offend the Spirit of God, and we must defend against letting anything out of our mouths that would offend God. We have a shield of faith and a sword of truth also. The amazing thing about this armour is that it has no protection on the back parts. Why do you think that is? Maybe the Lord requires us to press forward and therefore we require only armour to protect the front of us. It may also be that in pressing forward and fighting for Him he also fights for us and therefore He is our protection, He has our back! It could also be that with the kind of battles that we have to fight, once we have turned our back on the enemy and their temptations, they have no more power to hurt us, therefore there is no need to protect our backs. What we do know though is that we must wear it all. Remember the great mythological warrior Achilles? Here was a demi-god supposed to be remembered as a great hero, a marvellous warrior. But what was he remembered for? Not having every part of him protected. The famous Achilles heel. Achilles name actually means "grief of the people". Now compare this to Samuel the Lamanite. "...but the Spirit of the Lord was with him, insomuch that they could not hit him with their stones neither with their arrows." Samuel the Lamanite had no physical armour and we do not fight against flesh and blood in this fight, but it is clear that he and we must be fully dressed in the spiritual armour of God. There was no Achilles heel with Samuel. Being somewhat protected is not good enough. You must take upon you the whole armour of God and then like Samuel the Lamanite you will find that Satan will be unable to hit you with his stones or his arrows or his fiery darts! Absolutely ok to share - I posted them as my way of sharing the things I have learned. I’m glad others are finding use in them. Thank you!